“Who made thee a ruler and a judge over us?” – Lord Denning. Lord Denning’s rhetorical question used to be entirely relevant when Sarath Nanda Silva was Chief Justice of Sri Lanka. With Sarath Silva taking on the mantle of anti-corruption campaigner-in-chief, it is also relevant now. Silva appearing in this hypocritical guise has the potential to destroy the struggle against corruption in Sri Lanka. Fighting against corruption is itself an issue of integrity. There are several definitions and interpretations of the meaning of corruption. The general meaning is, “where a person, who should act with integrity, is guilty of dishonesty by accepting some form of bribe.” Another interpretation says, “A person who is entrusted with a public or private duty or obligation, to solicit any kind of inducement in whatever way other than what he/she is entitled to, in order to discharge such duty or obligation. Corruption takes place where people abuse their power for their own benefit, but not for what they have been obliged to do according rules. Public office used for private gain causes loss to the government and to the public”. According to Transparency International, there are many forms of corruption such as bribery, embezzlement, theft and fraud, extortion, abuse of discretion, favoritism, nepotism and clientelism, conduct creating or exploiting conflict of interests, and improper political contributions. Retired Chief Justice Sarath Silva is a prime example of someone who has indulged in most of these forms of corruption. He was, without a doubt, the most corrupt Chief Justice of Sri Lanka. An attempt was made by Parliament to impeach him on 6th June 2001. The United National Party and Janatha Vimukthi Peramuna acted in unison to move the motion of impeachment against the Chief Justice. The detailed allegations set out in that impeachment motion, in addition to the hundreds of columns in the independent press especially Sinhala weekly Ravaya at the time, are of such a serious nature that a man of integrity would have immediately stepped down. The same JVP is now lionising and promoting the same Sarath Silva as the champion of anti-corruption. Has the JVP changed its stance about Sarath Silva? How has he changed from being a violator of the law and morality to the JVP’s publicity front-man now? What does the JVP now say about the allegations in the impeachment motion? Using Sarath Silva in the fight against corruption only undermines the ongoing campaign ‘Voice Against Corruption’ which has been launched under the political leadership of the JVP. Chief Justice Sarath N. Silva used to be a good friend of President Mahinda Rajapaksa. Many years ago, Silva’s young son was even among Mahinda Rajapaksa’s wedding entourage as a page boy. I am reminded of my own experience with President Rajapaksa, then Minster of Fisheries. 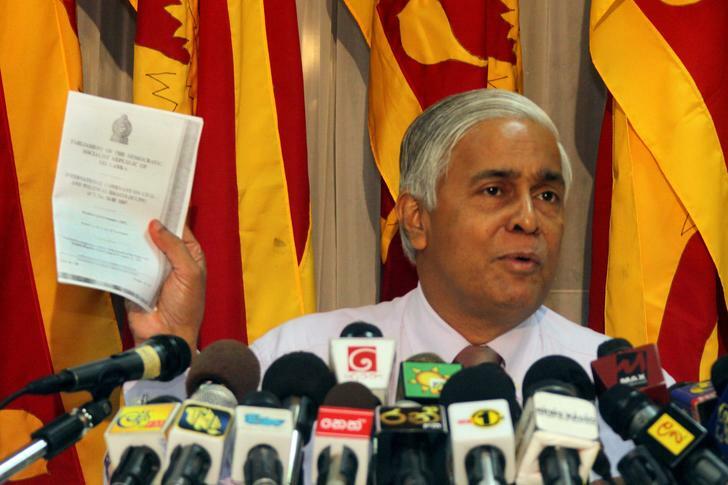 Once, Sarath Silva expressed his wish to resign from his post as Attorney General due to pressure brought by the press. Mahinda Rajapaksa immediately went to see Sarath Silva, along with Attorney Chandima Weerakkody (now Deputy Speaker), Dr. Ajith Ranawaka (now the President’s physician), and popular actor Kamal Addararachchi, and convinced him of the importance of staying on as AG. When I heard that story, I met Mahinda Rajapaksa and asked about it. He was unfazed. He took me by the hand and led me to his sitting room, where he pointed to his wedding photo hanging on the wall and said, “Look at this. This is Sarath’s son.” Sarath Silva’s son was the pageboy at Mahinda Rajapaksa’s wedding, in the early 1970s. That was the relationship they had. Ironically, Chandrika Kumaratunga’s own political appointee Sarath Silva was to turn against her in favour of her would-be successor. On 26th August 2005, Chief Justice Sarath Silva ruled that President Kumaratunga must step down from the presidency by December 2005, even though she argued she had another year in her term, paving the way for Rajapaksa to stand for election. In 2005, a series of in-depth investigative articles were published in The Sunday Leader on the ‘Helping Hambantota’ scandal, where it was alleged that post-tsunami reconstruction funds received by the then Prime Minister Mahinda Rajapaksa were being siphoned off into a private bank account controlled by him. Based on these articles, the opposition UNP made a complaint to the Police and to the Bribery Commission, and Rajapaksa was to be arrested. Before any action could be taken on the complaint, Prime Minister and presidential candidate, Mahinda Rajapaksa quickly filed a fundamental rights application. Chief Justice Sarath Silva, not surprisingly, gave a decision in favour of Rajapaksa and also stated in his order that he cannot act on the basis of newspaper reports. However, after he retired from the bench, Chief Justice Sarath Silva confessed at a seminar in March 2010, titled “Law, Democracy and the Country’s Future” at the Jayewardene Centre, that “Rajapaksa filed a fundamental rights application and…I took the stand not whether the complaint was true or false…but that it was politically motivated. If we had not taken such a decision…if the President had been remanded on the tsunami fraud allegations, he would never have been able to contest elections”, Silva added. It is important to note that following the investigations by The Sunday Leader, Rajapaksa was compelled to even return some of the moneys from his private account back to the donors. Therefore, in one sense, Silva was right to say that it was not a question of whether the allegations were true or false, but whether there was in fact political motivation. The difference is that such political motivation came from the Supreme Court bench, rather than from the newspaper that exposed this corruption. What does this imply? Where is the integrity of this man? Before they go championing this man the JVP must understand one thing: change begins with us. Sydney Smith once said, “Nations fall when Judges are unjust, because there is nothing the multitude thinks worth defending.” That is what happened to Sri Lanka. The man who is responsible for it – the most corrupt, partial and politicized judge in Sri Lankan history – is now talking about justice, democracy, good governance and corruption. Any movement for good governance in Sri Lanka that uses this man as its public face is bound to meet ignominious failure.